iRealty has partnered with their sister company, iRealty Title Services, Inc., to created a format to work with you from the beginning to the very end. And as always, with iRealty you will be saving money with the sale of your home without compromising quality. If you are more comfortable working with your own attorney, iRealty can provide your title services. Title insurance makes sure that the title to a piece of real estate is legitimate and then issues title insurance for that property. Title insurance protects the lender and/or owner against lawsuits or claims against the property that result from disputes over the title. During the title search the title company also looks for any outstanding mortgages, liens, judgments or unpaid taxes associated with the property, as well as any restrictions, easements, leases or other issues that might impact ownership. The title company may also require a property survey, which determines the boundaries of the plot of land that a home sits on, whether the home sits within those boundaries, whether there are any encroachments on the property by neighbors and any easements that may impact an ownership claim. Once the title is found to be valid, the title company will likely issue a title insurance policy, which protects lenders or owners against claims or legal fees that may arise from disputes over the ownership of the property. 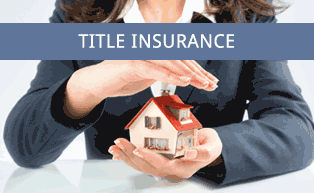 protects the property owner from title issues, and lender’s title insurance, which protects the mortgage company. When there is a cash deal involved, the seller pays more which is half the closing fees of buyer and seller, which is based on the purchase price. If you would like to know your Estimated Title Quote, please submit form below.